What is a Davies Molding Hockey Puck? 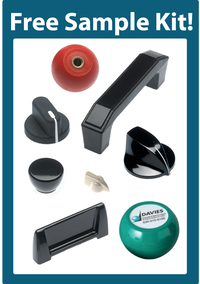 We've been molding plastic knobs, handles, cases, covers and custom parts for over 80 years! 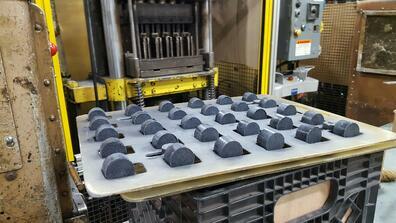 You may have heard us use the term hockey puck when we talk about compression molding. When we use the term hockey puck, we're not referring to the kind the Chicago Blackhawks play with. What is a Davies Molding hockey puck? In compression molding, the phenolic material comes in a granule form. We need to alter that form so it can be put into the press and the part can be formed. 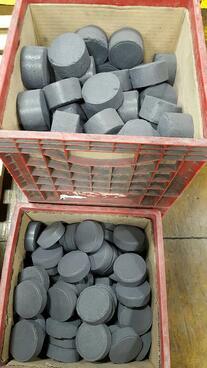 We take the granule material and make hockey pucks- preforms. Preforms can also be called tablets or pills. They come in different shapes and sizes depending on the size of the part we're molding. How do we make preforms? Preform sizes are selected to match similarly to the diameter of the cavity and the final parts. Preforms are slightly larger/heavier than the final part to ensure flashing and filling out of the whole cavity. Powder granules are poured into the hopper of the preform machines. Powder fills in the open space of the die and then a punch comes in and compresses the powder into a hard tablet/pill/hockey puck. The pressure from the compression of the powder into the die by the punch is enough to form the shape and hardness of the preform. Ejector pins eject the preform into a bin. The preform is then ready to be molded. To learn more about our processes and capabilities, please visit www.daviesmolding.com or call 800-554-9208.